I'm constantly searching for the perfect "no makeup" foundation for weekend days. Something to wear when I'm having a low-key day running errands, or going to see a movie, and want a little bit of coverage, but nothing heavy. My skin looks and feels better with a little bit of something on, because it helps keep the oil in check, so I try to find something with the lightest coverage that will still help keep my face from looking like an oil slick. 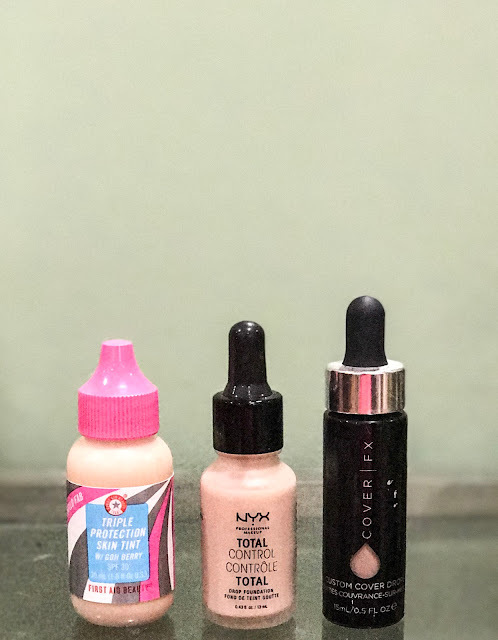 I've tried the Glossier Skin Tint, the NYX Total Control drops, the Cover FX Custom Cover drops, and the First Aid Beauty (FAB) Triple Protection Skin Tint. This is incredibly light coverage, by far the lightest of the batch. I liked how it felt on my skin; it was easy to rub it in with my fingers, and because it's so thin, you don't need for the color to be a perfect match for it to still look good. Unfortunately, though, it didn't agree with my skin at all, and I had a bad reaction to it and broke out. I tested it a few times to make sure it was the culprit, and I've convinced it was - it was the only new product I was trying. Glossier made it super easy to get a refund, and they didn't even ask me to send the product back, just to pass it along to someone else who might enjoy it, which I did. 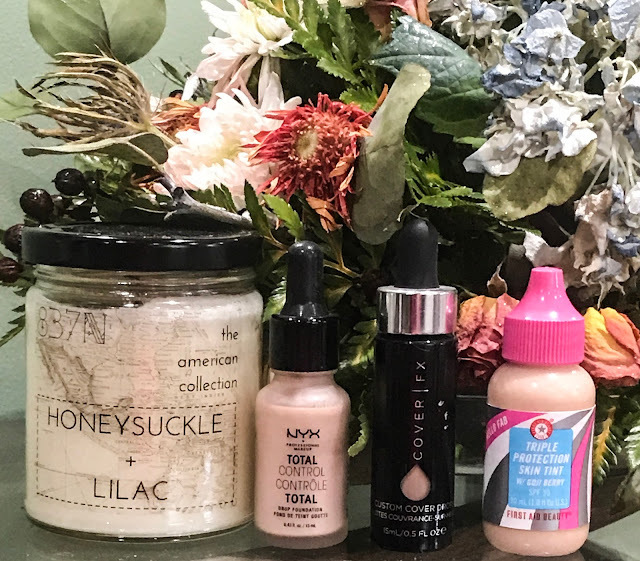 The premise behind the Custom Cover drops is intriguing - you can mix in drops with your normal moisturizer, so you can customize the amount of coverage that you want. One drop is light coverage, two drops is medium, and three is closer to full coverage. I liked the look and feel of this foundation, but I found the logistics a bit tricky. It was messy to mix in on my hand, and I always ended up with extra product that I had to wipe off. It's sometimes hard to get the amount of drops right - one drop didn't seem like enough to mix in with my moisturizer evenly, but adding more gave me more coverage than I really wanted. But if you want a product that you can customize, this is the one for you. I'm not sure if you're supposed to also mix these drops in with your moisturizer, but I put it directly on my face and found that it wore and blended well. It's definitely still liquid-y and runny; a few times I ended up with foundation on my clothes instead of on my face. I actually started just putting the excess product from the outside of the dropper onto my face, rather than trying to squeeze the contents onto my face, and found it a lot less messy. Make sure you shake well before using this, because it tends to separate, but I liked how it looked and wore on my face. This is the newest offering; I think it came out sometime last month. Unlike the Cover FX and the NYX, it isn't a dropper, but just a little squeeze bottle. The liquid is also much thicker than the other three, but it still blends out really nicely. This one came the closest to what I was looking for - it covers my skin but doesn't feel like heavy makeup, and wears well throughout the day. I also like that it has SPF, but I wouldn't use this as my only source of SPF - you'd have to use too much product to get the needed amount of SPF, and you'd end up with super full coverage makeup! Have any of you ever tried any of these, or any other no-makeup foundations? Let me know if the comments!